Among coin collectors or more technically known as numismatists, a commemorative coin provides a valuable snapshot of a significant event in the annals of a nation’s history. They are often minted in precious metals like gold, silver and platinum in 99.99% purity. Apart from their historical value, some getting museum-grade exhibition quality, they are considered investments that appreciate in value over time. The older it is, the more valuable it becomes. In addition, the more perfect their condition is, the more valuable as well. Among the countries that have some of the finest minted commemorative coins is the United States. Official commemorative coins are struck by the US Mint office and only the US Congress is empowered to authorize the minting of commemorative coins of the country. Every US commemorative coin is a legal tender but is not meant for monetary circulation. They are produced in limited quantities and only available to collectors for a short or limited period of time. Commemorative coins are generally either circulating or legal tender coins of limited monetary duration or special non-circulating ones. Both types celebrate special cultural or historic events and while the former carry its face value, the latter are often priced at a premium well above its face value. Most commemorative coins in Europe and elsewhere have been circulated as legal tender for a limited period of time. In contrast, US commemorative coins are specially minted coins that have never been circulated to the public as a monetary tender and are sold to collectors at prices well above what’s indicated on the coin itself, or its face value. They were minted, as their coin classification clearly indicates, to commemorate an event, an occasion or a person. It is not uncommon that these historic coins are specially minted to raise government funds for certain projects. Commemorative coins in the US were minted as a government mechanism for raising money instead of raising new taxes. Since 1982, when the US Mint resumed issuing commemorative coins, the US government had generated well over $418 million in funds that have helped build and maintain museums, memorial and monuments as well as Olympic sporting initiatives. It is interesting to note that between 1892 and 1954, the US Congress passed various legislative measures authorizing the U.S. Mint to forge non-circulated commemorative coins celebrating 53 different occasions, memorial events and personages. These resulted in 157 gold and silver non circulating commemorative coins of varying design. They remain some of the most sought-after and prized collectors’ items that have been appreciating in value over the years. But there have been cases when US commemorative coins have become so popular that the government would mint more and monetize them. This happened with the US Lincoln Cent and the Washington Quarter which were initially meant to have limited circulation of a year. They proved so popular the US Mint continued issuing them beyond the commemoration term. Some of the most valuable US commemorative coins date back to the middle or late 19th century. Most numismatic listings start with the half dollar coin minted in 1892 to celebrate the 400th anniversary of Christopher Columbus’ discovery of the New World. But based on official numismatist listings, the first recognized US commemorative coin as authorized by the US Congress were a couple of coins minted and issued in the same year to celebrate the Columbian Exposition. One was a half-dollar or 50-cent bullion silver coin and another was a 25-cent silver coin featuring Queen Isabella of Spain. Each coin was issued with 100 pieces of proof coinages. But even older than this is the two and a half dollar bullion gold coin stamped "Cal" and minted to celebrate the discovery of gold in the state of California. It was issued in 1848 and many collectors consider this as the country’s first commemorative coin. However, it did not get US Congress nod and was not considered an official release. But it remains one of the most valuable commemorative coins in anyone’s collection. 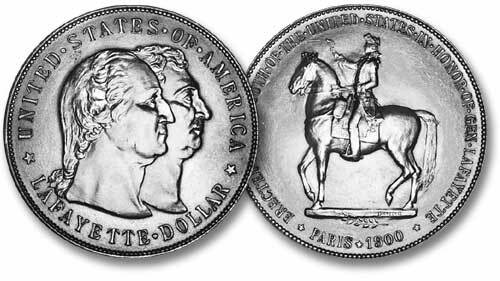 Serious coin collectors can have a field day going through 20th century compendium of commemorative coins in the US as there are many starting with the pure silver Lafayette dollar issued at the turn of the 20th century in 1900. There were more than 36,000 of these coins issued at that time. Some of the most valuable commemorative coins by today’s market valuation have been minted in the early years of the 20th century. And the simple reason is that they were mostly one-dollar denominated coins struck in pure gold. 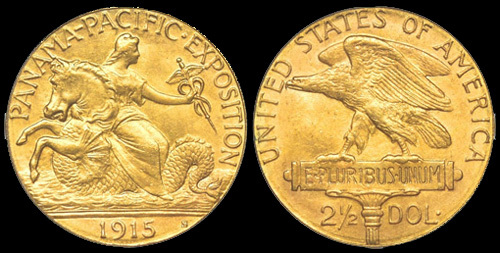 The cream of the crop of US commemorative coin is the $50 gold coin issued for the Panama-Pacific exposition in 1915. Its rarity is evident with only 483 coins minted in the standard round shape and 645 coins in octagonal shape. The Panama-Pacific exposition also saw the issuance of a $2.5 gold coin with 6,749 minted, a $1 gold coin with 15,000 issued and a 50-cent coin with 27,134 minted. After the $1 Lafayette coin issued in 1900, the next important commemorative coin in the $1 denomination was issued for the Louisiana Purchase Exposition in 1903 with 17,375 known mints featuring President Jefferson and an equal number featuring President McKinley. The following couple of years saw commemorative $1 gold coins issued for the Lewis and Clark Exposition – 10,000 coins each for 1903 and 1904. 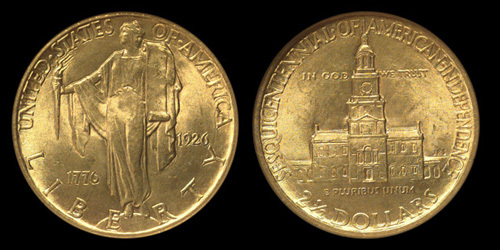 After the Panama-Pacific Exposition coins, 1916-17 released nearly 10,000 commemorative $1 gold coins for the McKinley Memorial and another 10,000 minted the following year. This has been popularly known as the McKinley Memorial Dollar. In 1922, the government issued 5,000 Grant Memorial coins and another 5,000 with the 5-pointed star insignia embossed. This set would be the last $1 commemorative coin minted in bullion gold until 1983 after the US Congress resumed authorizing the minting of commemorative coins. In 1926, the third and last $2.5 US commemorative coin minted in bullion gold was issued to celebrate the country’s Sesquicentennial independence with 46,019 coins minted and sold to avid collectors. There were also 141,120 half-dollar commemorative silver coins issued for the occasion. This would be the last commemorative coin struck in bullion gold until 1983. Between 1918 and 1938, there have been numerous commemorative coins issued but except for the $2.5 gold sesquicentennial coin issued in 1926, all subsequent commemorative tenders have been in half-dollar or 50-cent denomination minted in bullion silver. There were no more bullion gold coins minted during this period. Apart from the San Diego California Pacific Exposition which was commemorated with roughly 100,000 half-dollar silver coins minted in 1935, the Cincinnati Music Center establishment with 5000 silver half-dollar coins in 1936 and the Cleve/Great Lakes Exposition with 50,000 coins in the same year, most commemorative coins minted during the period were meant to celebrate memorials, bicentennials, centennials, sesquicentennials and tercentenaries. One commemorative coin celebrated Daniel Boone’s bicentennial in 1934. 1920: Maine Centennial with 50,028 coins minted and issued; the Pilgrim Tercentenary with 152,112 coins issued. The following year saw another 20,052 Pilgrim Tercentenary coins issued. 1922: Grant Memorial with 67,405 issues and another 4,256 with the star insignia embossed. 1938: New Rochelle, New York with 15,266 coins. 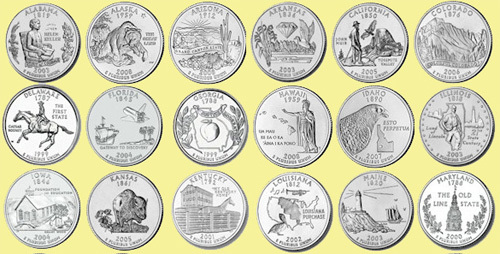 It is plain that just about every state wants to mark its centennials with commemorative coins and that’s understandable. The US Congress has been flooded with pending legislation to get these commemorative coins minted. It is not surprising that by 1939, the US Congress has had enough and promptly put a halt to all commemorative coinage. It would take another 43 years, almost half a century, for the US Congress to resume authorizing the minting of commemorative coins. In 1939, the US Congress passed the Public Law No. 278 of the 76th Congress which, as approved in August 5, 1939, prohibited "...the issuance and coinage of certain commemorative coins..." It effectively put an end to the minting and issuance of all commemorative coins even those already approved by that time. To be sure, there were exceptions made with Exception of Acts signed into law on August 7, 1946 when 50-cent commemorative coins where authorized for minting to celebrate the Iowa Centennial and Booker T. Washington. An amendment to the prohibition was likewise signed in 1951 for the George Washington Carver-Booker T. Washington memorial 50-cent coins. Minted from 1951 to 1954, the Carver-Washington 50-cent coins were the last commemorative coins for the pre-modern era. After this, the next official commemorative coin would be minted in 1982 for the 250th birth anniversary of George Washington.